Here's the Amtrak card that details the service changes for the Empire Service. Specifically, three roundtrip Empire Service trains (so, six total) will be cycling through Grand Central -- the 230, 236, 242 from Albany-Renesselaer and 233, 235, and 239 from Grand Central. Those trains out of Albany-Rensselaer have scheduled departure times of 5:02 am, 8:20 am, and 2:40 pm. 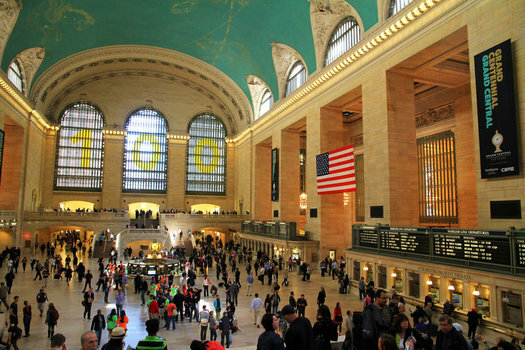 Grand Central is about a mile east of Penn Station in Manhattan. It is also many miles more beautiful than the bunker-like Penn. Albany-Rensselaer is one of the busiest train stations in the nation. It had more than 842,000 passenger arrivals and departures in 2016, the vast majority of those trips involving New York City. And New York Penn is the busiest train station in the country, with more than 10 million Amtrak passenger arrivals and depatures last year. This makes me want to go to the city by train instead of Megabus. I hate Penn Station and Grand Central is so much classier! Anyone know which tracks out of Grand Central these Amtraks are leaving? It's rather easy to know where to queue up at Penn, here not so much.